The Eccolo Symphony Padded Medium Custom Journal is a popular and affordable journal. Featuring its smooth padded front and back cover making them comfortable to carry and a joy to write in. Have your logo or event stand out with the Eccolo Calypso Pocket Custom Journal. The vibrant colored covers offer a beautiful contrast along with black page edges and accents. This Eccolo brand journal is everything you need and more. The Techno Lined Custom Journal is loaded with all the bells and whistles found in a journal. The Eccolo brand Tempo Large Custom Journal is sure to be the desired notebook to bring to meetings and seminars. Never lose your pen with the unique pen holder that is built-in to the spine. Use the Eccolo medium size Cool Custom Journal to fill with your inspiring thoughts and stories. The rich colors, and debossed imprint will compliment any logo or event. The Eccolo Cool Small Custom Journal, imprinted with your logo, is a small size making it easy to carry. Fill this journal with your upcoming tasks, quick notes or reminders for the day! Eccolo Symphony custom journals are just for you! 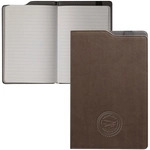 You won't believe the softness of the padded, leather-like cover and marvel at the way your debossed logo stands out. These Groove lined customized journals offer a modern, sleek and simple way to promote your company! It features a lay-flat binding, making it easier to wright in. Express your brand identity with the Eccolo Salsa Medium Custom Journal. The vibrant colored bookmark makes for a one-of-a-kind journal. Show the world that you are uniquely you with the Rhythm lined custom journals imprinted with your logo. These Euro-style Eccolo custom journals imprinted with your logo are sure to be the desired notebooks to bring to meetings and seminars. Never lose your pen with the unique pen holder that is built-in to the spine. Junior sized, contemporary Eccolo custom journals are a great gift for offices and the classroom. The convenient pen port allows you to keep your pen in a safe place without getting lost. If you are looking for a great desktop must have accessory to give your brand unbeatable brand exposure, then these Eccolo custom notepads with a magnetic pen holder has got what you want! Are you looking to stand out? Then make sure you buy these two-tone Eccolo custom journals which are the world's only journals with the pen holder on the top. These Eccolo custom journals include all of the bells and whistles of a European-styled journal at an affordable cost. Eccolo custom journals offer fine Italian craftsmanship and European design. Customized journals are the perfect product to present as year-end gifts, anniversaries and much more. Many prestigous companies, like The Walt Disney Company, Dell, The Ritz-Carlton, and the United Way, have used Eccolo promotional products as marketing pieces for their unique messages. Order yours today!